It was 8am June 14th, 85 degrees and sunny, when Dodd Shay and I (Carolyn Stone) took seats in the lecture room with only a partial understanding of what the next six weeks had in store for us. We knew we were there to learn the techniques of training service dogs. What we didn’t know was that the process would affect us on every level – intellectually, emotionally and physically. We were in Santa Rosa, California, at Bergin University of Canine Studies. The school is an accredited university, the only one of its kind, offering professional certificates, associates, bachelors, and master’s degrees in canine studies. Dodd and I were there for the six-week Service Dog Training Seminar taught by Dr. Bonnie Bergin, the service dog guru. Bonnie Bergin created the concept of the service dog, a dog that assists people with disabilities other than blindness or deafness. In 1975, she founded Canine Companions for Independence, now the largest service dog organization in the world. In 1991, she left CCI and founded Assistance Dog Institute (later renamed Bergin University of Canine Studies) and Assistance Dogs International. She has an amazing wealth of knowledge about canine behavior and teaching. There is a difference between service dog training and obedience dog training and she has refined her teaching techniques over 30+ years of experience. Our classmates came from Arizona, California, Colorado, New Mexico, Oregon, Texas, Germany, Japan, and Thailand. We all spent the first two weeks of the six week seminar in wheelchairs paired with a service dog-in-training. Together with our dog, we had training sessions, went to lectures and restaurants, stores, city buses and outdoor markets. Those of us not used to being in a wheelchair learned what life is like on wheels with a service dog. It’s hard to open a heavy door, wheel backwards, direct a dog and carry something at the same time – and that’s just to get INTO the bathroom! It became obvious that a knowing commands is only a small part of what makes a great service dog. 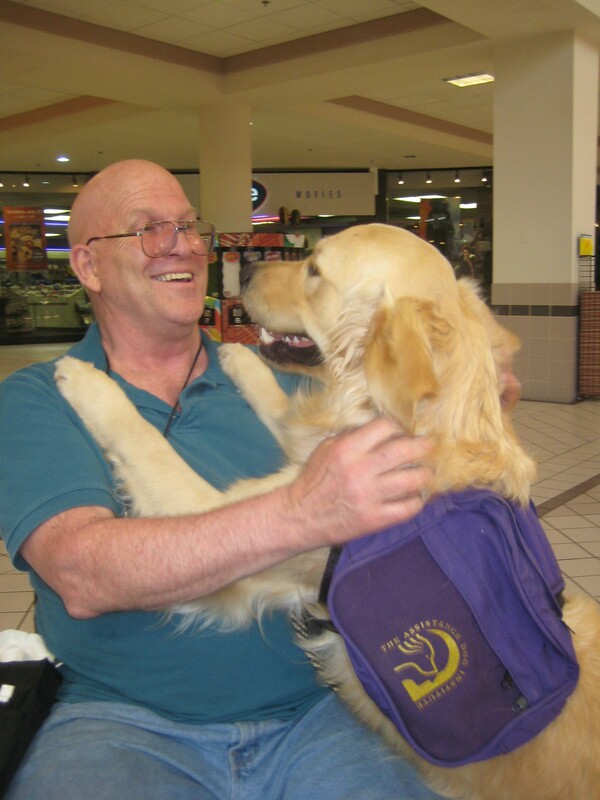 A service dog is a calm, attentive and unobtrusive helpmate – and a people magnet. A service dog works for his or her human because of the bond and appreciation from his or her human partner. Learning happens more completely through experience than by reading or listening. With a deeper understanding of life with a service dog, we said goodbye to the wheelchairs and hello to our new schedule. Kennel duty at 7am, puppy training at 8am, then teenage dog training at 9am, followed by guest lectures, training sessions, fundraising discussions and tours of other assistance dog organizations. 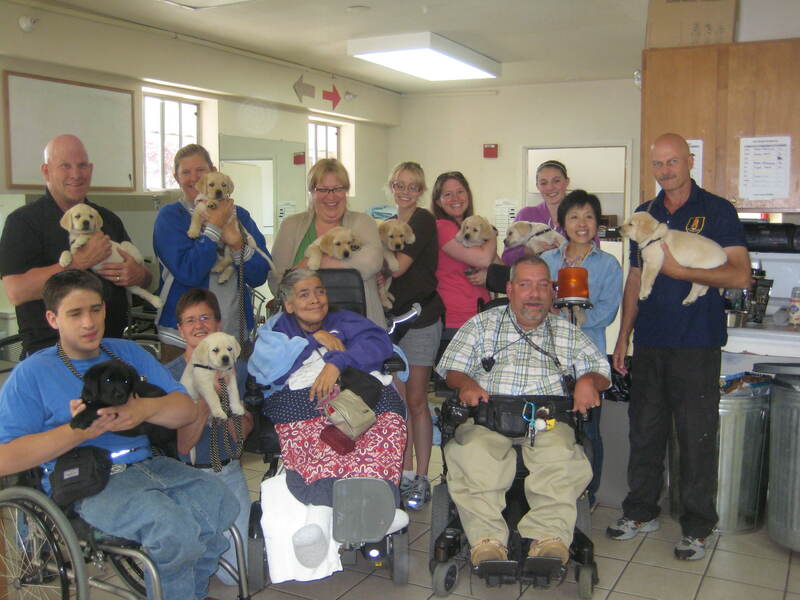 Santa Rosa, California is a mecca for assistance dog training. Guide Dogs for the Blind, Assistance Dogs International, Bergin University of Canine Studies, Canine Companions for Independence, Dogs For Diabetics are all located in the area. Our days were packed and we were grateful for our favorite type of learning that dogs and humans share – overnight learning. For the fifth and sixth week of the course, the tables turned. Clients arrived to be paired with their service dog and the students were now teaching the handling skills the clients would need for their success as a match. I experienced an amazing mix of pride and heart-wrenching loss when I watched Nila, the dog I trained, retrieve a plastic bottle for the young woman she’d be with forever. That same tail wag and calm way of being that I’d gotten to know made my heart swell and ache simultaneously. I wanted to explain not only general dog handling skills, but all the particularities about Nila, so the new team would get along wonderfully and understand each other completely. The funny thing is, that’s the part you can’t explain. The most frequently asked question of a service dog trainer is, “How can you give up the dog after all that time?” And it’s not giving of the dog that’s so difficult. It’s clear that a great service dog can change someone’s life and that’s what you want – it’s the whole purpose of the work. It’s the part that you can’t give away that leaves you tongue-tied and teary eyed. When you develop a bond and an understanding with another creature you can’t give that to someone even if you try. They can develop a strong bond on their own, but that’s entirely up to them. By the time graduation afternoon rolled around, the clients and student teachers felt exhausted, excited and like our lives had changed at warped speed. The tiny puppies we’d been training were now ten weeks old and proficient in over thirty commands. The graduating teams had bonded and gained a level of trust with each other. Family members were in town for the event and we knew that by the next day, we’d be certified and on our way back to the seven states and three countries we came from. At graduation, we got to hear from Bonnie Bergin, our teacher and the founder of it all, master’s students, a bachelor’s student, a client, a puppy raiser and volunteer teen trainers. My classmate, Heather Furby and I, got to speak about our experience in the Service Dog Training Seminar. Several others demonstrated linked commands with their puppies. I had to keep reminding myself that we were at the only canine studies university in the world and that this was in fact a unique experience, but it seemed so ordinary to have a service dog on stage with the MC, one with each client, five with the team trainers, two with the masters students, quite a few in the audience and puppies in the backstage area and to have all the students there completing their canine studies. What else would we be there for? Note: Carole Shay, the founder of Alaska Assistance Dogs, got her service dog training certification from Bergin University of Canine Studies (then called Assistance Dog Institute) in 2001. This entry was posted in AAD News and tagged Alaska Assistance dogs, Carolyn Stone, Certified Service Dog Trainers, Dodd Shay, Service Dogs. Bookmark the permalink.